Earn 10% cash back on all purchases when using your Gallo's Customer Rewards Card! Come in today to activate the gift that keeps on giving. Please see details below and contact us with any questions. EXAMPLE 1 - YOU HAVE 50 POINTS ON YOUR CARD FROM PREVIOUS PURCHASES. YOU ORDER $50 OF FOOD TO BRING YOUR TOTAL POINTS TO 100. WITH THE 100 POINTS $10 WILL BE PLACED ON YOUR CARD FOR A FUTURE PURCHASE. 100 POINTS WILL BE SUBTRACTED FROM YOUR TOTAL BRINGING YOUR CURRENT BALANCE TO 0. EXAMPLE 2 - YOU HAVE 50 POINTS ON YOUR CARD FROM PREVIOUS PURCHASES. YOU ORDER $80 OF FOOD TO BRING YOUR TOTAL POINTS TO 130. WITH THE 130 POINTS $10 WILL BE PLACED ON YOUR CARD FOR A FUTURE PURCHASE. 100 POINTS WILL BE SUBTRACTED FROM THE 130 BRINGING YOUR NEW POINTS BALANCE TO 30. EXAMPLE 3 - YOU HAVE 50 POINTS ON YOUR CARD AS WELL AS PREVIOUS REWARDS OF $10 THAT HAS NOT BEEN USED TO PURCHASE FOOD. YOU ORDER $80 IN FOOD TO BRING YOUR TOTAL POINTS TO 130. WITH THE 130 POINTS, $10 WILL BE PLACED ON YOUR CARD AND ADDED TO THE CURRENT REWARDS AMOUNT OF $10 GIVING YOU $20 IN TOTAL REWARDS. 100 POINTS WILL BE SUBTRACTED FROM THE 130 BRINGING YOUR NEW POINTS BALANCE TO 30. 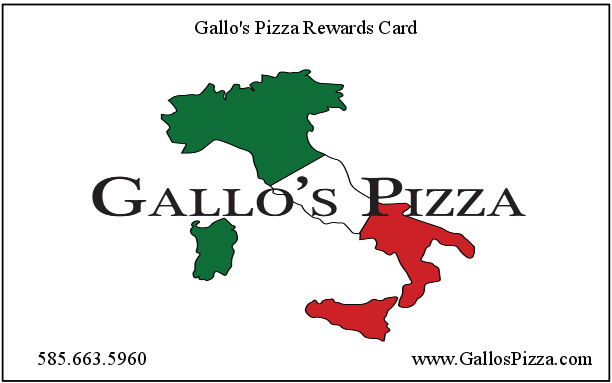 - IF YOU ARE PICKING UP YOUR ORDER PRESENT YOUR REWARDS CARD TO A GALLO’S PIZZA EMPLOYEE TO GET CREDIT FOR YOUR ORDER. - IF YOU ARE HAVING YOUR FOOD DELIVERED LOCATE THE 18 DIGIT NUMBER ON THE BACK OF THE CARD IN THE UPPER RIGHT HAND CORNER TO GIVE TO THE GALLO’S PIZZA EMPLOYEE TO GET CREDIT FOR YOUR ORDER.